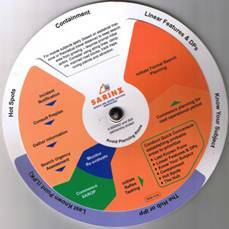 The Search Wheel leads students or experienced search planners through the initial response phase of the search. It is lightweight, durable, and waterproof. 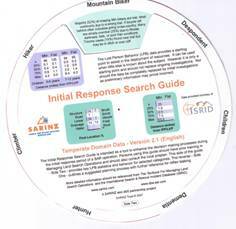 Side One provides handy information on the steps needed to commit to a search effort and then deploy resources. Simply rotate the search wheel to tackle each critical topic. Topics include the Last known Point, The Hub or IPP, Know Your Subject, Linear Features & Decision Points, Containment, and Hot Spots. Additional information provided on reflex tasking. Side two presents essential information and behavior profiles for the most common lost subject categories. It covers hikers, mountain bikers, despondents, children, dementia, hunters, and climbers. The windows reveal the most current data on distance from the IPP/LKP and where the subject was found for both mountainous and flat terrain. Data taken from the International Search & Rescue Incident Database (ISRID) which contains 50,000 SAR incidents. Find the specific information you need immediately.